Jewish Lights Publishing, 9781580233477, 127pp. 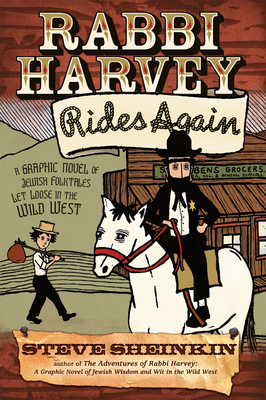 As his fame grows throughout the Rocky Mountains, Rabbi Harvey meets new characters--including the luckless gold miner Abigail--and faces a slew of new challenges. He encounters the return of "Big Milt" and Wolfie Wasserman (the most feared father-and-son outlaw team east of Nevada), and investigates another bold crime by the sweet-faced Bad Bubbe. And, as ever, the Rabbi is the quickest draw in the West--when it comes to pulling out bits of Talmudic insight to fit any occasion, that is. Like any great collection of Jewish folktales, these stories contain layers of humor and timeless wisdom that will entertain, teach and, especially, make you laugh.